The Peace Bridge connects Interstate 190 in New York to Queen Elizabeth Way in Canada. We have complete information on this border crossing on our Peace Bridge border crossing page. Although there are Customs plazas at both ends of the bridge, tolls are only collected when entering Canada. Once vehicles leave the Canadian Customs plaza, vehicles approach a smaller toll plaza to pay toll for using the Peace Bridge. There is no charge for crossing the bridge in the U.S. bound direction. Tolls can be paid in US or Canadian dollars or with EZPass. As of this writing the bridge is still accepting the old Peace Bridge tokens but only at staffed toll booths so make sure you pick the correct lane. There are no tolls for pedestrians or cyclists. 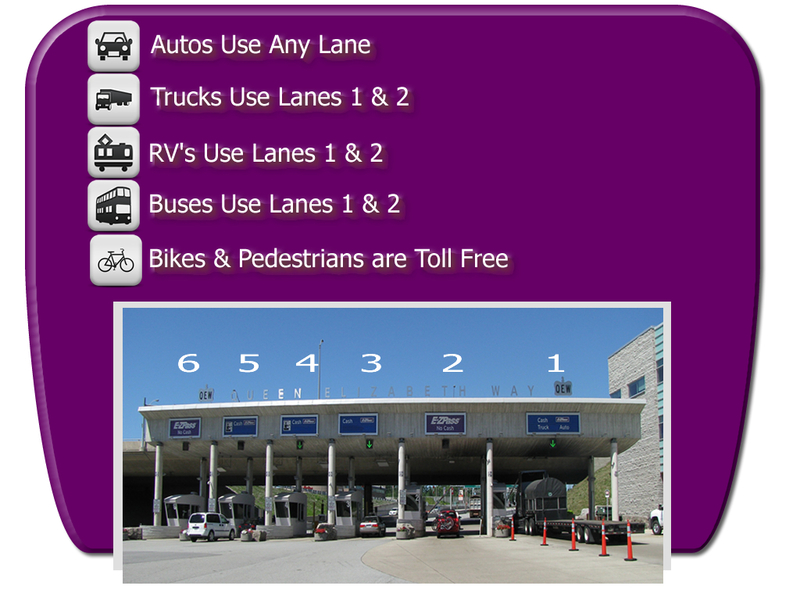 The bridge uses E-Zpass system for electronic toll collection which provides a discount off the cash toll rate. NEXUS cards can be used on the bridge and there are dedicated Customs processing booths for NEXUS card holders.